Expensive connection does not give you any guarantee of best internet speed or quality. It is always quite frustrating to learn that even after paying more on a connection, you are not getting top class quality in terms of speed and customer support. Generally you come across to listen to such issues of slow connection in home connection but there is no major change in experience when it comes to commercial internet service also. Like a home connection, your experience with a commercial connection also varies service provider to service provider. You need to take a right call on a connection to get maximum benefits at minimum prices. Before choosing any connection for business or home, you need to know your exact need and requirements of the data as it will help you to get best broadband connection at best price. There is always a change in the requirements of an internet connection for businesses. Therefore following points will help you to understand your business need and enable you to take a right call on getting a right connection. How many numbers of employees working at our organization? In how many parts is your business extended in terms of locations? Whether your business can bear downtime? Is your business really needed a superfast web connection? Is your business needed more online communication? Here you need to understand that the productivity of your business mainly depends on your web connection. From revenue to profitability, everything quite depends on your web connection nowadays. Be it a small organization or big company, you cannot comprise with the quality and reliability of web connections. Here you should always remember that due to slow connection, your voice-over-IP phones communication with your clients can be disturbed that may create a bad impression on the clients. So don’t take a risk with your connection and always look for a web connection with best speed and better connectivity! Never try to run your online business with a residential web connection as there are always a lot of risks involved such as lack of connectivity, downtime and inconstancy. There is always a big difference between residential fiber optic connection and commercial fiber optic connection. So don’t just look for a fiber connection, check your need first! If you are unsure about business class or enterprise class connection then it is always good to find it from any business associate which type of connection can suit to your business as per your requirements. A right connection always helps you to complete your online works quickly as compared to other traditional or slow connection. Be it downloading or uploading or live streaming, you can do whatever you want to do online without facing any issue related to speed if you have a right and effective web connection. Just check your business needs and get a right connection as per your business, you will surely see a vast change in the productivity and profitability. 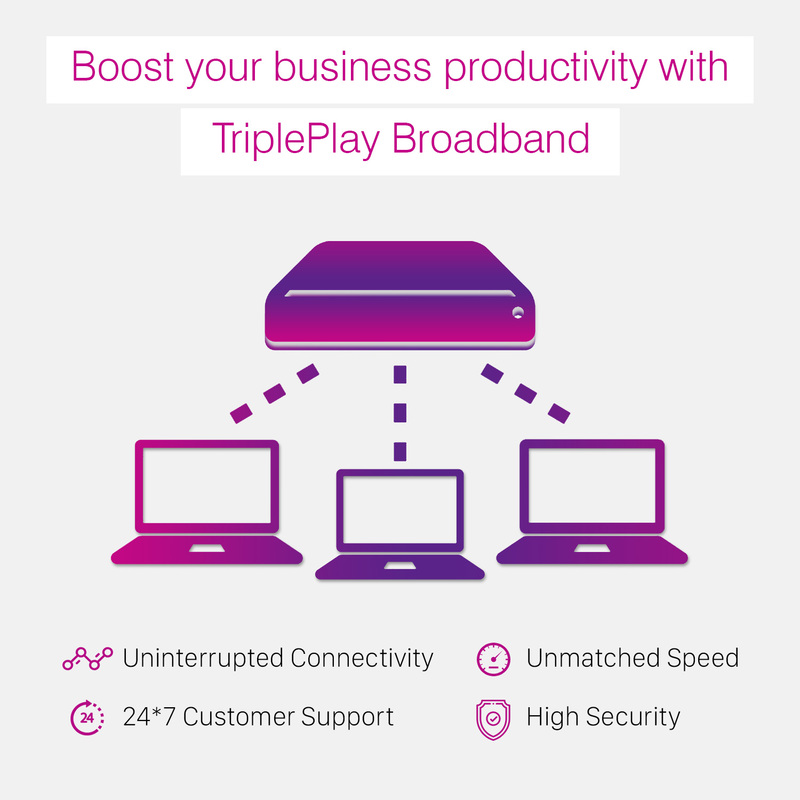 No matter what sorts of business you have, there is hardly anything better than TriplePlay Broadband connection in Delhi and NCR. You will always get best speed and best priced data plans in wide range. So choose the best commercial internet service now to get the best results!